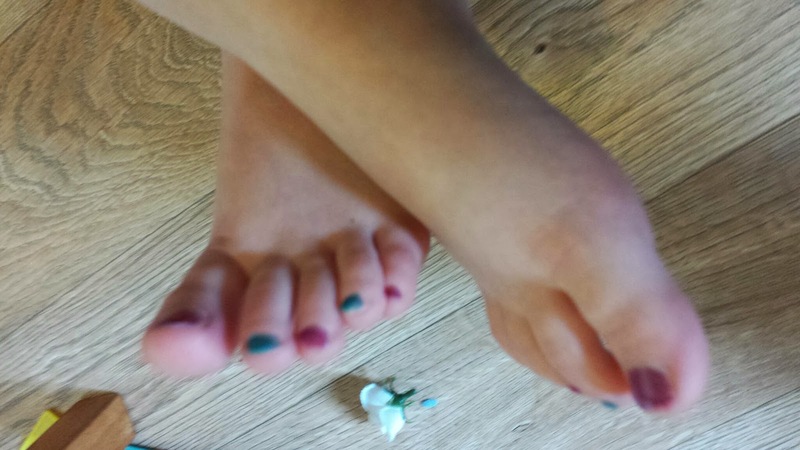 We had a letter from school explaining that nail polish is definitely not part of the school uniform. Freya was sad this morning when I had to take off her birthday weekend nail polish off for Monday morning at school. I showed her my nails, they were beautiful orangey/red at the weekend but we're now woefully plain and short because of my shift yesterday. I told Freya that the matron at work would shout at me if I did because that was MY uniform too. We made up the rhyme "Nobody knows about my toes..." said with a wink because although we can't have nail polish on our hands during the week, we can rock a snazzy pedicure. This is Edie's aurora/ariel/aurora design... I liked it so much I have one too!